iZettle, the “Square of Europe” that has been rolling out its dongle-based mobile payments service in Scandinavia and is currently trialling in the UK, is now extending its service once again: it’s launching an API so that third-party iOS app makers can integrate its payment service directly into their apps. An Android solution is due later this year, the company tells me. Although Square does not directly compete with iZettle at the moment — Square has yet to extend outside the U.S., and iZettle’s still only in Europe — it looks like iZettle has stolen a march on Square in terms of functionality, letting merchants offer the iZettle payment platform wherever their apps are used, and not just at the point of sale, where iZettle’s own app would get used. iZettle’s spokesperson notes to me that Square did appear to try something out like this a while back, for Android but not iOS, but had not developed it further. One thing is more certain: “We are the first ones to publish an API like this for iOS and in Europe,” she notes. This, if anything, makes iZettle not just into more of a competitor, but a company that might actually make a good complement to a company like Square or another that is building up a strong base in mobile payments but has yet to cover some areas — be it in terms of regions or functionality. To date iZettle has raised $16.4 million in funding from Index Ventures and others. It will be worth seeing, whether two years on from Square’s API attempt, merchants and app developers, and users, will be more inclined to use something like this: “We launched the Square API in May, 2010 to make it easy for other applications to integrate Square to accept credit card payments. Due to the limited implementation, we’ve decided to deprecate this API and have no plans to develop it further,” a Square developer wrote on Github in April 2012 explaining the situation. iZettle’s new API service will work like this: a developer incorporates code that links up with a custom URL scheme, which allows users to initiate requests for payments from the iOS app for either the iPhone or iPad. 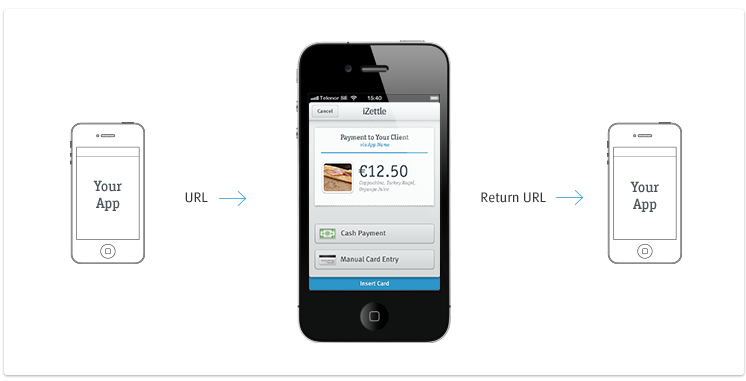 This takes the user to a new iZettle window, and then automatically returns users back to the app. More explanation for developers, and a sign up, is here. iZettle notes that this would be useful in cases where, say, a food delivery company or event organiser is already using its own apps to take orders or payments, but in a way that requires them to take the users online to actually process the payment. “Ultimately, our API makes it easier and faster for users to process sales,” Jacob de Geer, iZettle’s CEO, says. This is in addition to those times when at a point of sale a merchant is using iZettle’s own app to process payments. The company says that the service, already used by 50,000 merchants, will be rolling out an Android version later this year — key since Android is overall the most popular smartphone platform in iZettle’s main market of Europe — and it is also testing our service on a few of of the bigger European markets. “Our aim is to launch in several European markets towards the end of the year. Essentially all markets that operate with chip cards as a standard is an opportunity for us,” the spokesperson told me. iZettle is compliant with Europay, MasterCard and Visa, as well as the Payment Card Industry Data Security Standard (PCI-DSS). It first started its service in Sweden in August 2011, and now also works in Denmark, Finland and Norway, as well as the UK trial.